Growing up, the sound of music was a constant in the Cox household. As a boy, Roderick Cox joined his mother and brother in their Macon, Georgia, gospel choir. At home he would put on his own concerts in his room — with the help of his action figures. It was clear he had a good ear and the passion, but for a while, the furthest point he imagined going in his musical career was becoming a band director. And then his worldview opened up. Cox began his musical journey at Northwestern University where he studied conducting under the tutelage of famed Russian Conductor Victor Yampolsky. It was actually Yampolsky who planted the seed in the young musician's mind. “Yampolsky, who was very charismatic to me, told me 'You should be a conductor.' At first – I laughed at him. But after he reiterated that, it started to become a reality for me,” says Cox. Now two years into his role as associate conductor of the Minnesota Orchestra, he's come a long way from leading a convocation of action figures. “Ninty percent of the work happens outside of the actual concert," says Cox. "Learning the music,really determining a vision for the music, shaping the music, providing structure to the music, and going for the right sound." But do top-tier musicians really need a conductor? Cox loves to answer this question. "There are 80 different artists on stage, 80 different opinions," he says. "So if first flute feels, 'Well, I think the tempo should be this way. Or we should phrase it this way,' but — first principal cello thinks, 'Well, no, no, I think it should be this way,' then it's my job to say, 'This is what we're gonna do, ladies and gentlemen. Let's continue!'" Cox is just one of a handful of African-American orchestra conductors in the world — and at age 30, certainly one of the youngest. Even with his undeniable talent, the road hasn’t been easy. “You’re clawing yourself through the profession. I always say you can’t want to be a conductor you have to need to be a conductor,” he says. It’s having that attitude that helps you withstand, “hundreds of rejections and people, organizations telling you that you’re not good enough,” says Cox. The space isn’t the most inclusive either. Despite being praised for their genius in so many genres across the musical spectrum, Black folks, have been largely left out of classical music. Cox said he felt inspired to do his part to change that and is working hard to break down the barriers that exist between different kinds of people from different walks of life. 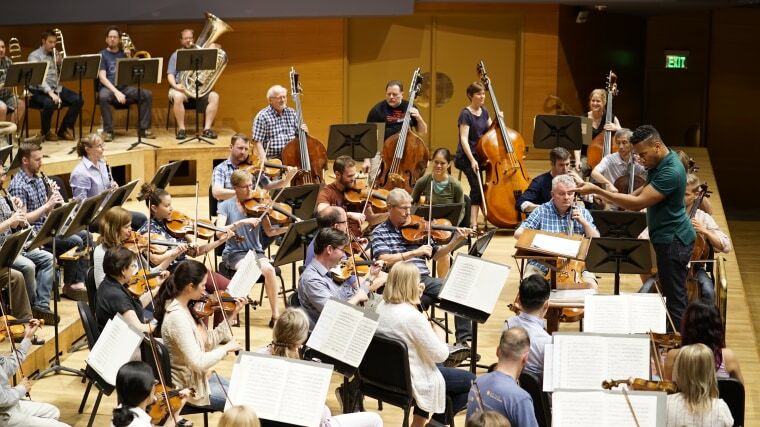 In an effort to do so, Cox and the Minnesota Orchestra will sometimes take their rehearsals outside and perform in front of new crowds. “I think it’s important for people of different races and backgrounds to see themselves represented onstage,” says Cox. Cox believes that with the racial landscape of the country changing, so will the orchestra. “I think as our country continues to diversify, we as an orchestra have to diversify. Diversify our music choice, diversify our vendors, diversify our audience, diversify the musicians on the stage,” he says. Though young for a conductor, Cox has already achieved a notable level of notoriety in his field despite all the challenges he’s encountered. In addition to Cox’s love for the music, his unselfishness has been one of the key ingredients to his success.